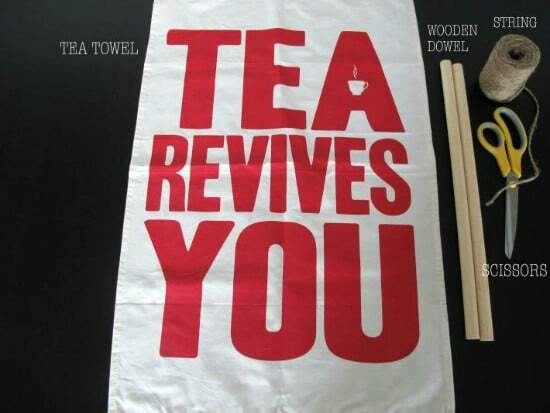 The crafting genius that is Mel Wiggins has come up with the easy and eye-catching tea towel DIY that she’s kindly let me share with Moral Fibres readers. It’s a perfect craft idea for beginners too! This project can make the simplest of fabric scraps look professional, takes 15 minutes to complete and costs next to nothing! 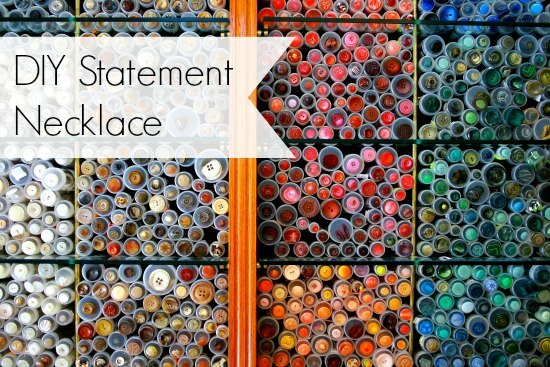 The wooden dowels can be found at any B&Q, Homebase or similar DIY shops and are about £1 each – you might need to chop the length in half or adjust it some for the right size. 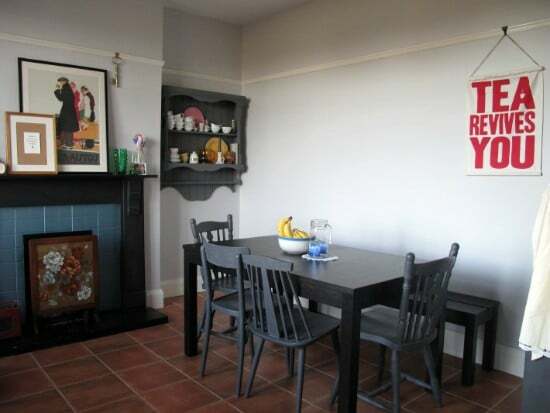 These give the tea towel some weight and help it to hang nicely. 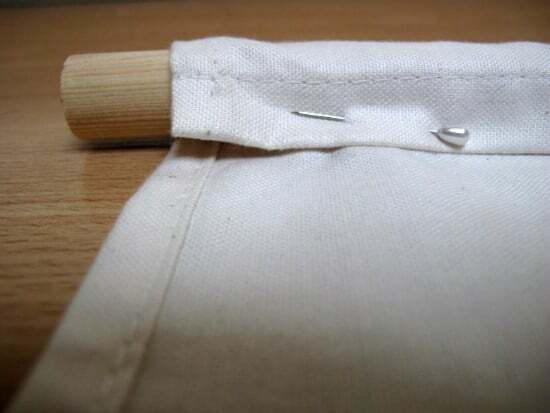 Pin in the dowel into the fabric at both ends by folding it over so you can see how much room you need in sewing the hems at the ends. 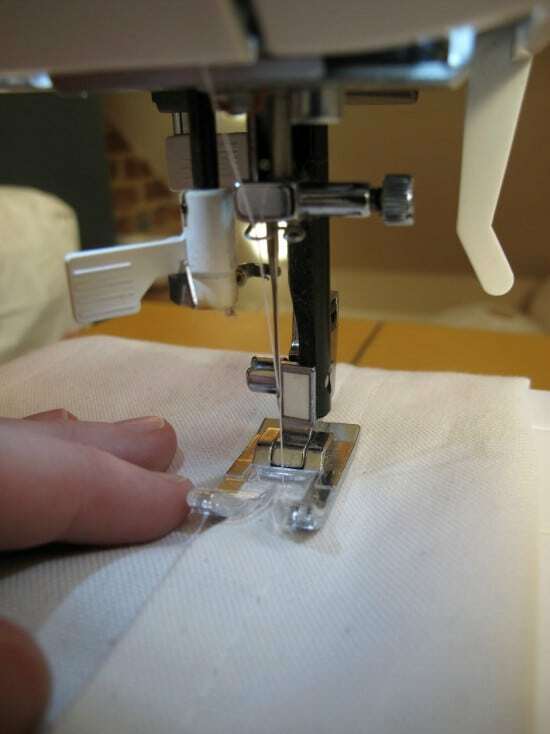 Take the dowel out and sew your hem on both ends. Cut your string long enough to fit through the top hem and to tie into a nice triangle at the top. Tie a knot in one end of the string and feed it through the top hem. Now you can put the dowels in the top and bottom hems and tie your string to suit the length you want to hang your towel. I like to hide the knots in the hem to give it a more clean effect. Now hang up your wall hanging and enjoy! 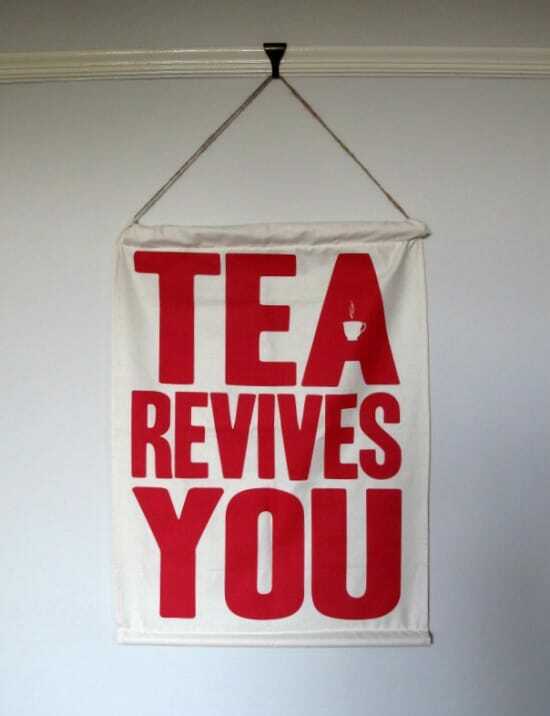 And why not pour yourself a cup of tea – you deserve it! Thanks Mel! You can catch more off Mel’s craftiness over on her fantastic blog! 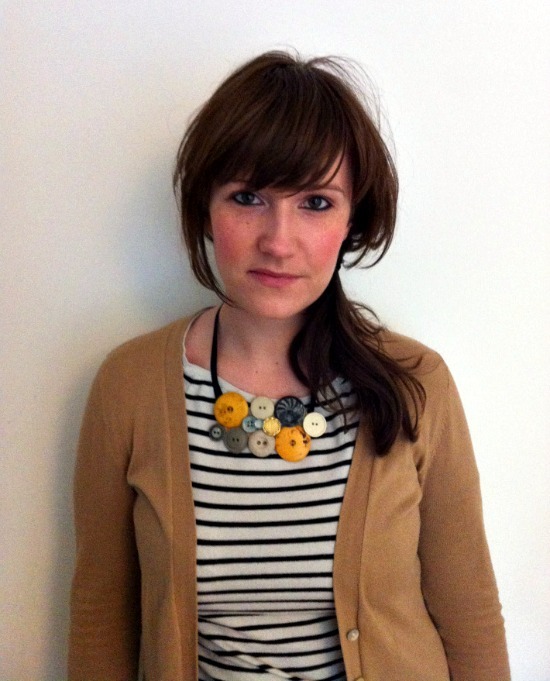 Today on Moral Fibres I’m featuring one of my very very favourite internet ladies, Mel Wiggins. 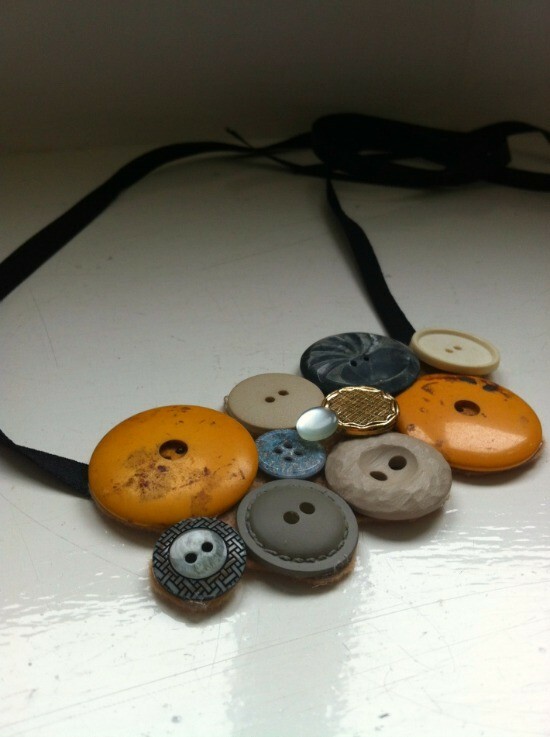 Mel is going to show you one of her fantastic recycled craft ideas – a DIY statement necklace made out of spare buttons and felt scraps. Done in just fifteen minutes, it’s the perfect craft for anyone lacking in patience for long-winded crafty projects. 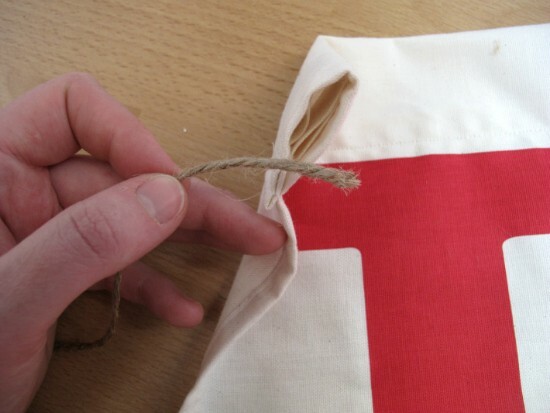 And the very best thing is that it’s so easy that even a crafting novice like me can easily complete it! 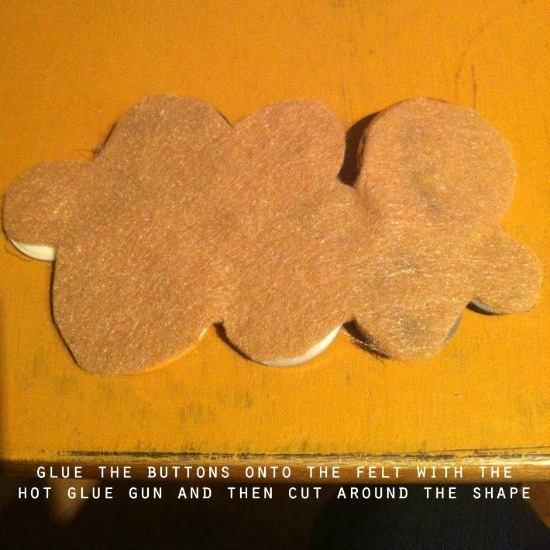 If you’re looking for some craft ideas for kids then this would also be the perfect project. Now that summer holidays are in full swing then if you’ve got bored kids on your hand just hand them some buttons, felt, scissors and glue (with supervision of course!). Now admire the finished product! 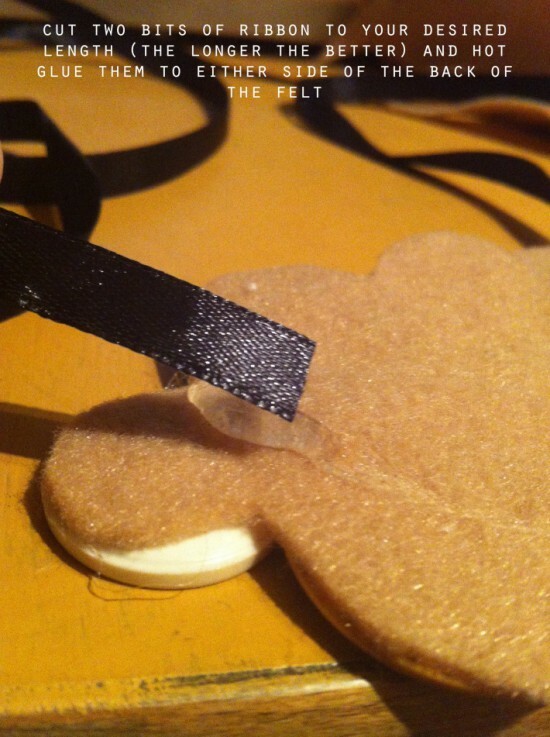 Leave the glue to dry, then ta da! A boutique looking piece made for just pennies from recycled materials! If you enjoyed Mel’s tutorial then you can follow her fantastic blog here, and also find her on Twitter and Instagram. I don’t know about you but I’m off to give this a go! And if you’ve got any favourite craft ideas then do share in the comments below! ps: some other craft ideas for kids – craft ideas from junk; craft ideas from cork, and my craft ideas Pinterest board, full of crafty ideas and projects that I’ve found!